Century Cycles Blog: Join The Cycle! 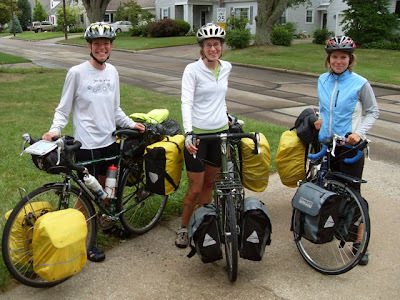 Here are Melissa, Casey, and Hannah, three young women who have been riding their bicycles from Los Angeles, California since June 11, and plan to reach Boston, Massachusetts on September 25. They have called their adventure Join The Cycle, and their aim is to promote the concept of traveling by bicycle for all ages and abilities. They are shown here getting ready to leave the home of a friend of Century Cycles owner Scott Cowan, who forwarded us the picture. The next day, they happened to meet Scott by chance on a side street near our Rocky River store. A few days later, they ran into business media blogger Matt Haze, who posted this video interview with them on his web site. You can read more information about Melissa, Casey, and Hannah on their web site, www.jointhecycle.com, and follow their trip blog at jointhecycle.blogspot.com.